and women who have helped shape and define our tradition down through the generations. composed music by Tom Doorley. The Comhaltas National Folk Orchestra of Ireland, under the musical direction of Tom Doorley, are in final rehearsals for their latest performance titled “LEGACY” which will have its world premiere at Fleadh Cheoil na hEireann 2017 in Ennis on Friday 18th August in the Shannon Aerodome. When Tom was given the challenge of Legacy, he immediately decided that the emphasis should not be solely on newly composed music. He felt strongly that we should not lose sight of the great musicians, singers and composers who kept the music and song alive in more difficult times. Tunes and songs that are centuries old are still being performed today thanks to the efforts of composers and collectors, musicians and singers, who fought a growing tide that threatened to sweep our culture aside. From O’Carolan and Raftery to Ó Riada, Rowsome and Crotty, visionary men and women have made possible a unique inheritance for our generation – a true ‘Legacy’ for the Ireland of today. Tom Doorley has certainly brought his unique style of arrangement and composition to the Orchestra and has brought the sound back closer to the original orchestra which was set-up in the mid-nineties. The 1995 Orchestra, under the guidance of Micheal Ó hAlmhain, performed ‘Slad agus Slanú” for the Oireachtas of that year and the show as subsequently recorded and transmitted by RTE in January 1996. The link to today is Tom Doorley himself. Tom was the composer of “Slad agus Slanu” and as he says, “It’s great to be back, with the Orchestra again after 20 years. I’m delighted and honored to have the opportunity to work with the Folk Orchestra on this very exciting project. I’ve had the privilege of teaching and performing with many of the Orchestra members in the past and look forward to this exciting journey”. At the Fleadh, ’Legacy’, will take you on a journey through the musical and cultural landscape of Ireland honouring some of the great men and women who have helped shape and define our tradition down through the generations. Inspired by some of our greatest tunes and songs, Legacy will also feature newly composed music by Tom Doorley and will be scripted and directed by Ray Conway who has been integral to the Folk Orchestra since 2015. Tom Doorley was born in Dublin in 1972 and has been playing for many years in both Classical and Traditional music circles, in Ireland and abroad. With lessons from Vincent Broderick and influences from many musicians including Seamus MacMathuna and Matt Molloy, Tom has established his own style. Widely regarded amongst musicians as a master flautist, he is known for his wild and unpredictable melodic and harmonic variations and for his tenderness of treatment in playing for songs. Tom joined Danu in 1996 and has become very well know to audiences as a great storyteller in both English and Irish and with a very tongue in cheek sense of humour. As a spokesman for the group Tom was the very public face of Danu for many years and is a very friendly and light-hearted person. Yet, Tom is also someone who takes the history and the playing of Irish music very seriously and his love, commitment and dedication to the Tradition should never be underestimated. This is reflected in Legacy, where Tom has taken established and well-known tunes and breathed fresh life into them with his clever arrangements and settings that are new, interesting and engaging while at the same time true to their origins. Now settled back home in Dublin, Tom is a tutor and lecturer in Irish traditional music at DIT, a teacher and adjudicator with Comhaltas and a dedicated father and husband. LEGACY premiered at Fleadh Cheoil na hÉireann Ennis 2017 on Friday 18th August. 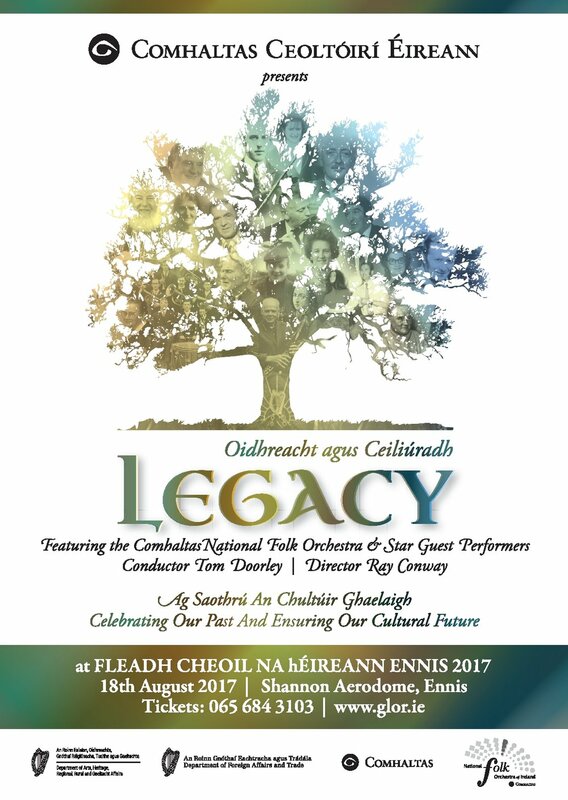 There are two upcoming performances of Legacy in 2018: 17th August at Fleadh Cheoil na hÉireann Drogheda 2018 and 1st November at the Parliament Buildings in Stormont, Belfast. Please visit the NEWS section for more information. at Fleadh Cheoil na hÉireann Drogheda! Legacy 2018 will take you on a journey through the musical and cultural landscape of Ireland honouring some of the great men and women who have helped shape and define our tradition down through the generations with the spotlight on the contribution of the musicians, singers and poets from the Northern tradition. Legacy 2018 will feature newly composed music by Tom Doorley, with a revised script from Ray Conway who will also Direct the show. The Comhaltas National Folk Orchestra will play by special invitation in the Great Hall, Parliament Buildings, Stormont, Belfast - on Thursday 1 st November 2018. This event will be by Invitation only and further details will be released as soon as they are available. Legacy premiered in Ennis at the Shannon Airdome with a capacity attendance of 2000! The superlatives flowed in abundance - "brilliant", "fantastic", "awesome", "uplifting" and many more. The prolonged standing ovation from a much energised audience said it all: this was an experience of a lifetime. An Tánaiste Frances Fitzgerald TD, who spoke at the event, lauded the sheer artistry of the Comhaltas National Folk Orchestra of Ireland and the creativity of Tom Doorley. An Tánaiste expressed the wish that Legacy would take to the stage again on some future date... Certainly a possibility, but for now it is time for the Orchestra and the production team to take a well deserved rest. Macalla 1916 made it’s world premiere on Friday night at the Barbican Centre in London! Among the guests in attendance were Irish Ambassador Dan Mulhall and his wife Greta, John Concannon, Director of Ireland 2016 Centenary Programme and Ann Finnegan, President of Comhaltas Ceoltóirí Éireann. Prior to the concert, Comhaltas presented the Ambassador and John with special commemorative medals. · 27th March, 2016 (Easter Sunday): TLT Theatre, Drogheda, Co. Louth. Get your tickets for "Macalla 1916: An Echo of the Past... A Vision for the Future" Orchestral Suite premiere at the Barbican Centre in London clicking the following link! Michael Rooney is immersed in the creative process of composing the Suite of music. 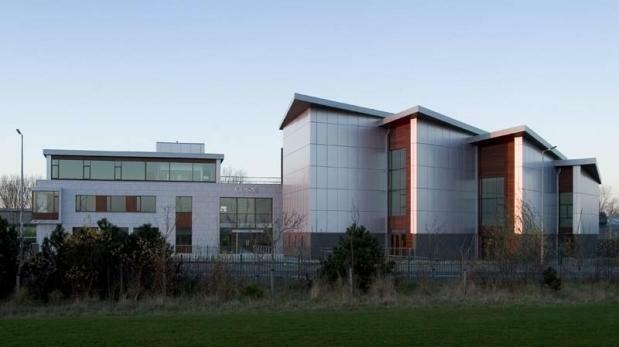 Rehearsals with the Orchestra to begin in November at CLASAC, Comhaltas' Regional Centre in Clontarf.